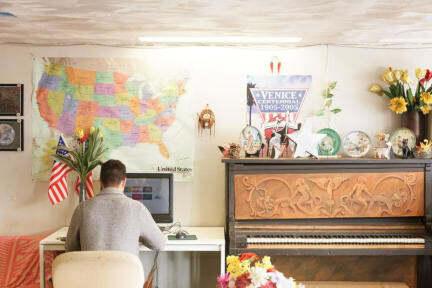 Venice Beach Hostel i Los Angeles, USA : Boka nu! Would stay here again! Nice rooms, bathroom gets cleaned every day, good but basic breakfast, top location directly at the beach, nice helpfull and friendly stuff, there are a lot of homeless people around this area but I never felt unsafe, near the airport, nice communal area. Fair price for what you get. A nice hostel with good staff and service. It is a bit dirty with bugs and broken walls, but nothing harmful, and it makes up for it with being so close to the beach, walking distances to so much (Santa Monica Pier, 30minutes) and good bus connections. Overall a nice experience.